Why do we love Ginkgo biloba trees? Their strikingly beautiful, fan-shaped foliage that turn a golden-yellow in the fall are a great place to start. A few of our other favourite things about Ginkgo biloba, also known as the “maidenhair” tree, are that they are deer resistant, low maintenance and have been around for more than 270 million years! Maidenhair trees are native to China and have various uses in traditional medicine. They will grow best in full sun to part shade, they have average water needs and they are salt-tolerant which makes them a good choice for those who landscape near the ocean. Mariken- with its small spreading form, it is an excellent specimen to bonsai, grow in a patio container, rock garden or near a water feature. When the leaves do drop, they drop quickly, forming a golden carpet around the base of tree. 3’ tall x 3’ wide. Troll – with its small compact size, the Troll is an excellent plant to grow in a container or in a small, rock garden. Foliage is a lush green in the spring and then the foliage turns bright yellow in the fall. 3’ tall x 3’ wide. Jade Butterflies- a small to medium tree with a very dense form with large, scalloped, dark green leaves that look similar to a butterfly’s wings. Foliage turns bright yellow in the fall. 8’-12’ tall x 6’-10’ wide. Spring Grove- one of the nicest dwarf trees with it’s rounded compact habit. The Spring Grove’s leaves are a bright chartreuse that cup slightly upward. This plant thrives in full sun. 4’-6’ tall x 3’ wide. 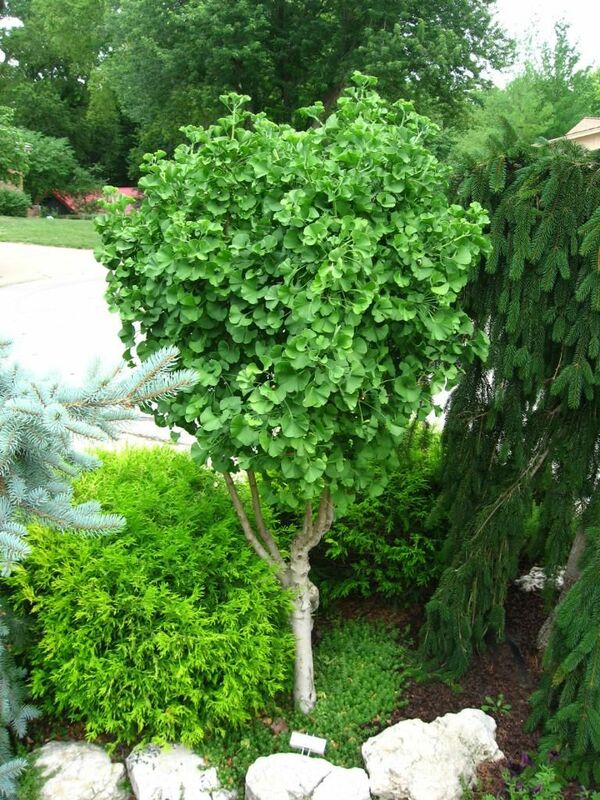 Princeton Sentry- is a larger form of Ginkgo biloba that matures to 40’-50’ tall x 20’-30’ feet wide. Easily grown in average, medium moisture soil in full sun. Leaves turn a uniform golden yellow in autumn. Previous Previous post: Biggest Plant Sale of the Year!